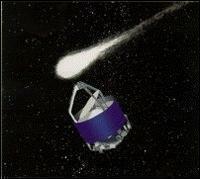 The purpose of the Giotto mission was to study Comet Halley during its closest passage to the Sun (known as perihelion) in 1986. The spacecraft was named after the famous medieval Italian artist, Giotto di Bondone (1266-1337). Inspired by the reappearance of Comet Halley in 1301, Giotto transformed the Star of Bethlehem into a golden comet in his 1304 fresco "Adoration of the Magi", which can still be seen today in the Scrovegni chapel in Padua, Italy. By spacecraft standards, the 960-kg Giotto was quite modest in size. Its main body was a short cylinder 1.85 m in diameter by about 1.1 m in height. It contained three interior platforms: the top platform (30 cm thick), a main platform (40 cm), and an experiment platform (30 cm). Each of these consisted of a disc within the cylinder on which were mounted various subsystems and science experiments. On top of the cylinder was a tripod which surrounded a 1.5 m diameter high gain dish antenna and gave the spacecraft a total height of 2.85 m. The main rocket motor was positioned in the centre of the cylinder with the nozzle protruding from the bottom. The most difficult problem to overcome was how to ensure that Giotto survived long enough to snap its close-up pictures of the nucleus when the spacecraft and the comet were heading towards each other at a combined speed of 245 000 kmh-1. On launch in July 1985 Giotto was sent into a circular orbit inside the Earth's taking 10 months to orbit the Sun. Eight months into its first orbit, Giotto passed the nucleus of comet 1P/Halley at a distance of less than 600 km. Having completed six full orbits in five years, the orbital positions of Giotto and the Earth coincided in July 1990 enabling Giotto's orbit to be boosted by an Earth gravity-assist manoeuvre. The new, wider orbit put Giotto on a two-year intercept course for a second comet encounter with 26P/Grigg-Skjellerup. European Space Operations Centre in Darmstadt, Germany.